James b 16th February 1839 Unsworth d 24 December 1901 at 24 Alexandra Road, Southport. At the time of his marriage to Martha Jackson 27 September 1865 he was a bookkeeper in Prestwich. By 1881 he was a colliery agent living at Holy Fold Road, Bickerstaffe with eight children and two srvants. The Heyfield, Westleigh and Lower Hall collieries were sold by the executors of James Diggle to James Grundy of Bickerstaffe on 31/3/1884 who along with other partners formed the West Colliery Co Ltd on 12/7/1884. The mines lists show that Lower Hall Colliery closed on 18/1/1929, the other two remained open until Feb 1937. 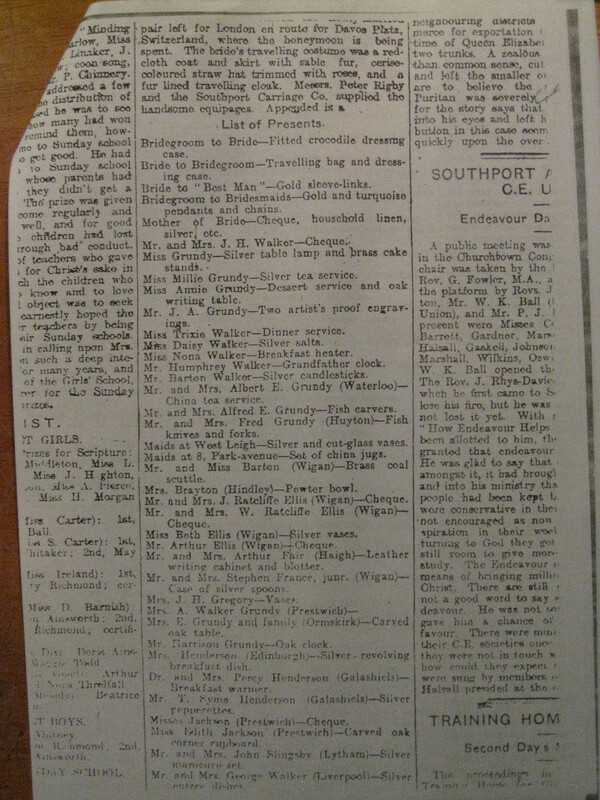 'WiganWorld' records the death of James Grundy of Brynn Hall collieries 24.12.1901 in his 63rd year. He used to commute from his house, Bannel Head, south of Kendal. 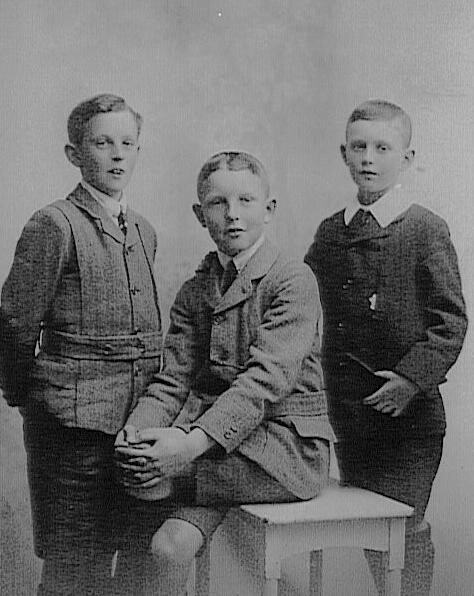 He owned the coal mines with two of his children, Alfred Ernest and Fred. Albert Edwin: b 1867 d 1913 marr Amelia Wrigley 1896 Southport. In 1891 he was a ship banker's clerk; in 1901 a builder's merchant. They had one son, Edwin. Albert left an estate of £1,854. Edward: died young but left one son. 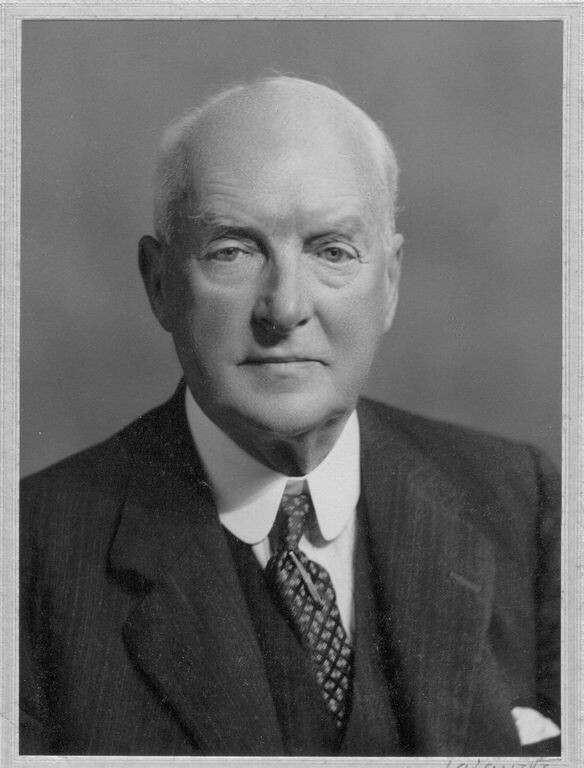 James Arthur: born 1869 d 1954. He practised as a solcitor in Manchester for 63 years from 1891. 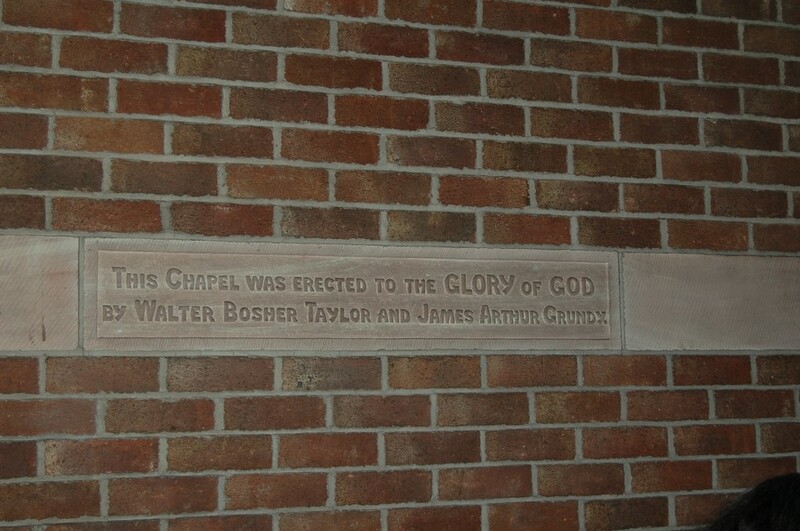 He had a home in Albert Road, Southport and also 'Battlefield,' Church Stretton, Shropshire. Edith 'Needy' Mary: b 1871 d 1931. Never married; she had been engaged to a rich brewer but backed off because she disapproved of living off 'demon drink.' 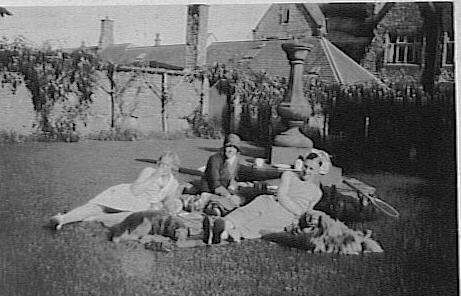 When she died she left an estate of £6,557 18s 7d to Eliza Wood, widow, and William Abel Grundy (relationship unknown), bank cashier. Alfred Ernest: b 1872 d 1954 marr Cecile Mary Dickson 1900 Southport. In 1901 they lived at 33 Knowlsey Road, Southport and in 1904 he was a colliery proprietor. He was told by mining engineer Howard J Walker, his brother-in-law, to shut down his pit as it had exhausted its coal. 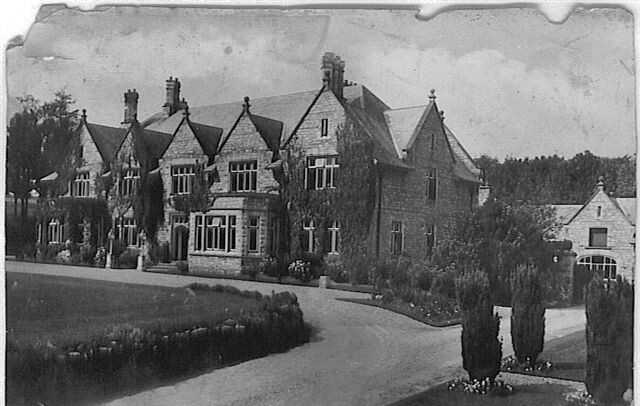 But the Grundys kept on extracting lots of money as directors from the firm and there was a major legal dispute between him and other members of the family who were share holders in the Bryn Hall Colliery Co which came to court in May 1920. He was forced to leave Lancashire and moved to Essex. 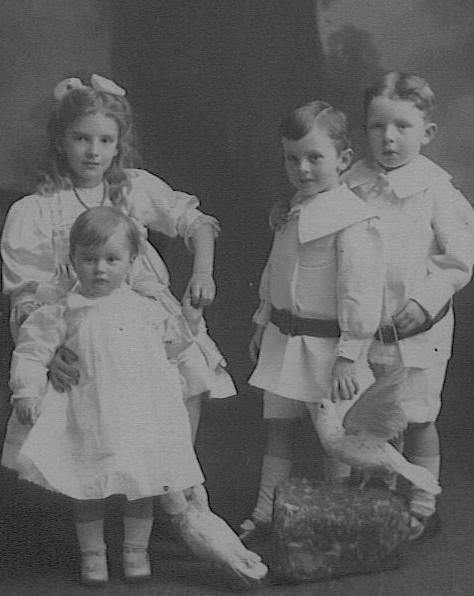 Alfred and Cecile had seven children: Cecile. b 1901, Winifred Lovice b 1901, James 'Jim' Herbert Nevyl b 1903 d 1968, Alfred Lionel 'Mickey' b 1904 d 1984, George 'Rex' Reginald b 1907 d 1987, Phyllis M b 1911 d 1981, Jean Margaret b 1916. 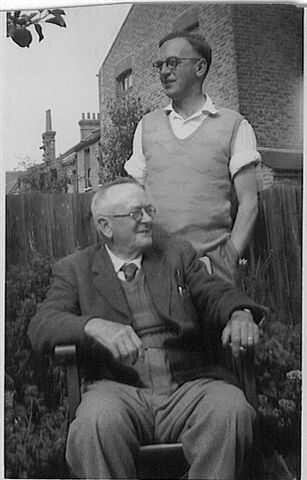 Frederick William 'Frank': b 1875 d 1959. 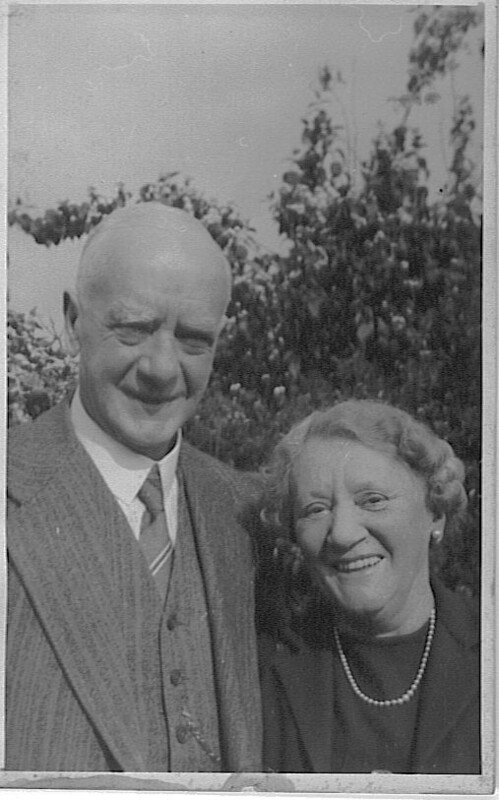 He married Helen East 'Nellie' Broadbent in 1903 in Southport. He was a mining engineer and they had four children. Amelia Jackson 'Milly': b 1877 in Bickerstaffe d 1960. 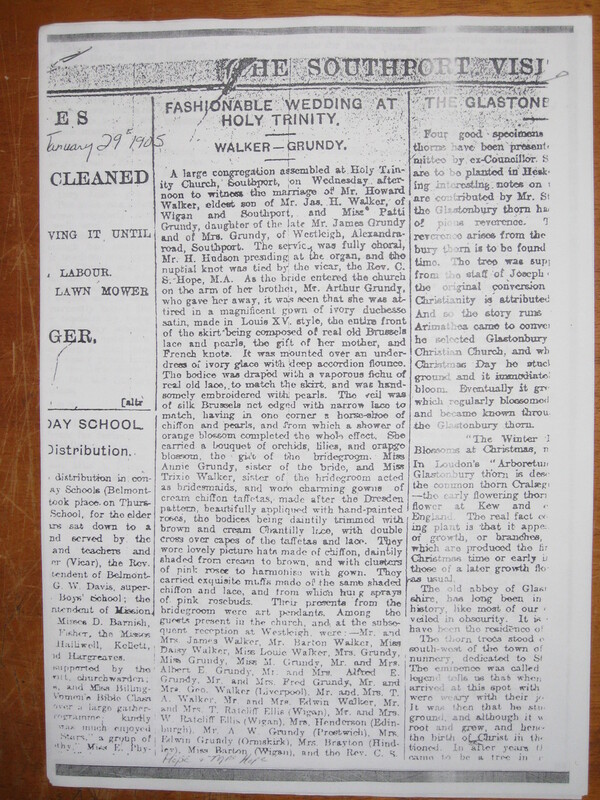 She married Rev Thomas Holme in 1916. They had two children. Annie Elizabeth: b 1878 she married Percy Fernihough in 1906. They had two children. 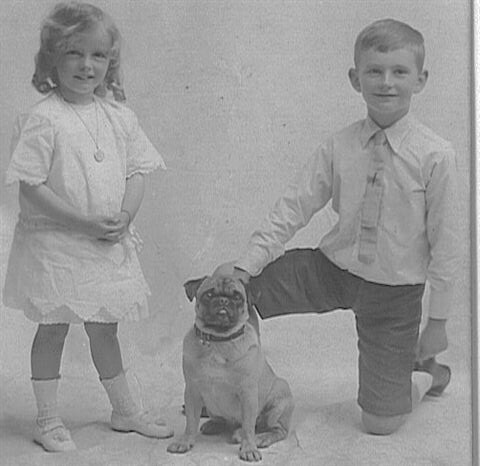 Martha Ellen 'Chickie': b 13th June 1881 Bickerstaffe d 25 Aug 1962. She married Howard James Walker in 1905. They had four daughters. 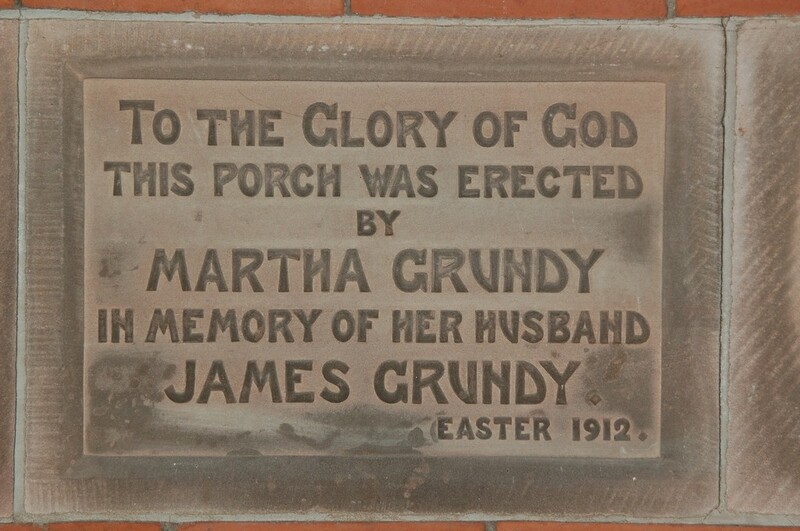 Both parties …… Fredrick William Grundy, son of the late Mr. James Grundy, Alexandra Road, Southport, and Miss Helen East Broadbent, daughter of the late Mr. Samuel East Broadbent of Belfast and Douglas. The Rev. ?? Grub ?? officiated, being assisted by the Rev C.S.Hope (Vicar of Holy Trinity). The bride was attired in a beautiful dress of accordion crepe de chine and chiffon with gloves and lace trimmings, together with gauze veil and wreath of real orange blossom. Her brother , Mr S.A.Broadbent, gave her away. 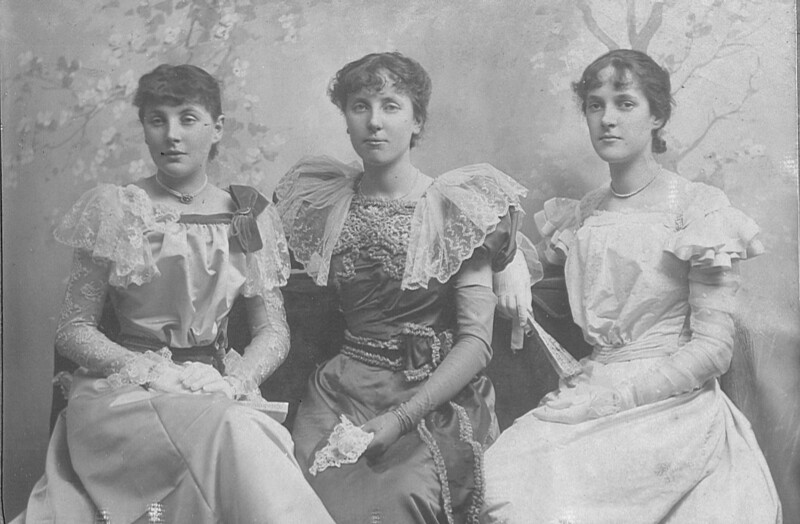 There were four bridesmaids – the Misses Mabel and Violet Mona Broadbent, and the Misses Millie and Annie Grundy. 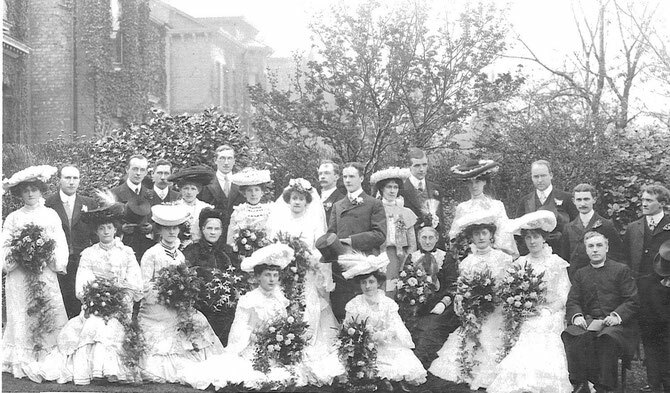 There dresses consisted of cream chiffon over cream silk, with lace coats and touches of pale blue, and hats to match. They also carried bouquets of carnations. Mrs Taylor aunt of the bride, wore a dress of black silk, trimmed with Maltese lace, and also wore a black bonnet with pink roses, and carried a bouquet of pink roses. Miss Broadbent (sister) was handsomely attired in a dress of pale blue with a black hat. She carried a bouquet of yellow roses. Miss Beatrice Broadbent’s dress ?? heliotrope with heliotrope hat. She carried a bouquet of William Allen Richardson roses. Miss Audrey Broadbent was attired in a cream dress with blue hat, adorned with pink roses, and carried a bouquet of pink roses. Miss McFerran (Belfast) was attired in grey, with trimmings of lace and tangerine. She has a black hat and carried a bouquet of William Allen Richardson roses. 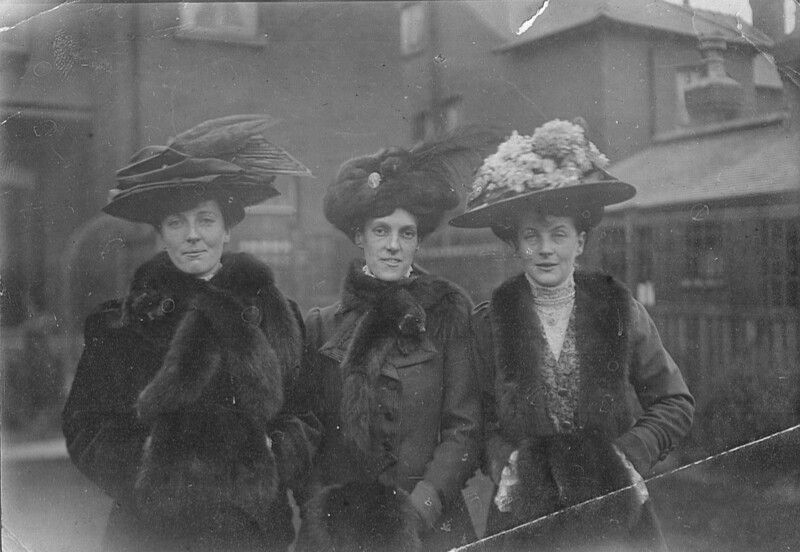 Miss Kirk (Belfast) wore a dress of pale blue, with black and white hat. She also carried a bouquet of yellow roses. Miss Grundy was attired in a dress of grey crepe de chine, trimmed with lace, and also had a floral toque. Miss P Grundy’s dress was of cream voile, trimmed with roses. Mrs Grundy was attired in a dress of black silk with a black toque. Miss Jackson’s dress was of biscuit-coloured voile, trimmed with green satin. Her toque was of green satin. Mr Stuart Richards acted as best man. At the reception subsequently held were the following among others in addition to the names already mentioned: - Mr Cyril Broadbent, Mr J W Taylor, Colonel, Mrs and Miss Richards, Lady Dobson, Mr L Dobson, Mr P Gordon Dobson, Miss Dobson (Teignmouth), Misses Harrison, Mrs Harrison, the Rev C.S. and Mrs Hope, the Misses Sadler, the Rev C Grub, the Rev Gerald Richardson, Dr and Mrs Popert, Mr Lamort Cauthey (Belfast), Mr Macoun (Belfast), Miss A Fisher, Mrs Hammond Fisher, Miss Learoyd (bardsley), Mr and Mrs Storey, Mrs Knowles (Park-road). The newly married pair afterwards departed for London. The bride’s travelling costume was of grey, with trimmings of white, together with a black hat. The dresses were supplied by Mrs Butterworth. 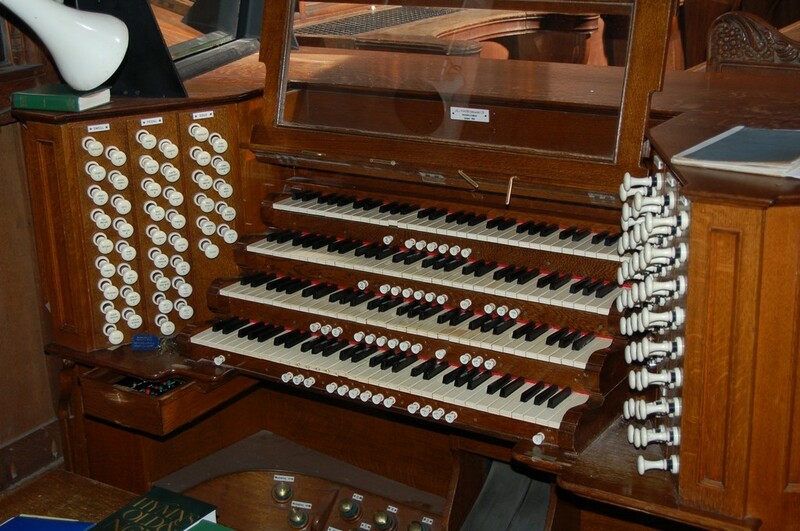 Messrs Peter Rigby were responsible for the handsome equipages.